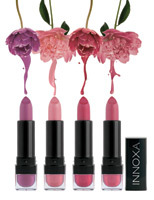 Innoxa introduces NEW Lovely Lips lipstick range. Containing natural ingredients and infused with minerals and sunscreen, Lovely Lips nurture and protect lips on every application. Jojoba oil provides a smooth application and deeply conditions lips whilst mineral pigments with no artificial colours create a naturally vibrant colour. Lovely Lips leave lips looking soft, supple & hydrated.